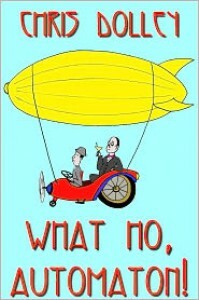 Two words sums up this collection: Wodehouse Steampunk.The first one is about how Reggie and Reeves met, and the second they search for missing debutantes.Both stories were fun to read. Reggie acts like an bored young noble man should act. Reeves is the one with brains. Emmeline is a debutante with a spine. They join up and search for the missing debutantes, and hilarity ensues. Reggie had a lot of wild ideas, Reeves managed to stop some of them. And oh my. I laughed a lot. They fumbled around, while searching for the debutantes, but in the end they managed to find all of them.When it comes to the setting, it felt very realistic, from the pressure to marry and behave properly, to the Victorians fascination with inventions. The 1900's were a time with a lot of experimenting, and this shows in the story. It was nice that there were no zombies, or other paranormal aspects. Instead the steampunk element came from the automatons, and the Promotheans. The book was well written, and I laughed a lot. But when I can to page 100 or so, I started to get a bit tired of the over the top humor. Also, it didn't feel like Reggie grew as a character. He was the same person at the end as he had been in the beginning.Still, I'll definitely read more by Chris Dolley.